A male passenger on board the "Magellan" was medevaced in the Outer Hebrides after suffering heart problems east of the Island of Barra. The vessel was only on its second day of its nine day voyage of its British Isles Discovery Cruise when the incident occurred. HM Coastguard received a call from the vessel on Aug 28, 2018, around 11 p.m. requesting urgent assistance to transfer the patient to hospital. Stornoway’ s Coastguard SAR helicopter were launched to the scene, transferring the patient to Glasgow’s Queen Elizabeth University Hospital for further treatment. The vessel continued its cruise visiting ports including Portree, Kirkwall, Honfleur in Normandy, Guernsey and the Isles of Scilly before returning to Dublin. A passenger of the "Magellan" which was about 20 nautical miles north of Barfleur, was medevaced by a Cayman helicopter of the French Navy on Jan 6, 2018. The Cross Jobourg, in liaison with the Maritime Operations Center of the maritime prefecture in Cherbourg, was alerted after the passenger complained of chest pain. A teleconference was organized with the Toulouse Maritime Medical Consultation Center (CCMM) and the SAMU in Le Havre and a medical evacuation was decided. The CROSS alerted the helicopter of the Navy base in Maupertus which took on board a team of the Medical Center of the army of Querqueville and took off at 4.58 p.m. Around 6 p.m., the patient was hoisted aboard the Cayman helicopter of the 33F flotilla and taken to the Pasteur Hospital in Cherbourg. 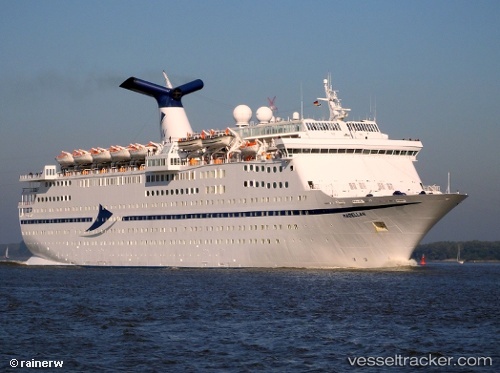 British based cruise operator CMV Travel & Leisure Group will deploy the Magellan to the Pacific coast of Mexico for winter 2019 to support the launch of Cruceros Marítimos Vacacionales and its Riviera cruise programme for the domestic Mexican market. Magellan will begin operations on 3 February 2019 with a winter debut season of eight seven-night sailings homeporting from both Acapulco and Manzanillo. “CMV specialise in the development of dedicated source markets having successfully established markets and programmes in the UK and Ireland, Germany, Australia and France,” said Christian Verhounig, CEO of CMV. “CMV will currently be the only exclusive Mexican cruise product available on the domestic leisure market. The Mexican market offers great potential and we plan to extend the season in 2020.